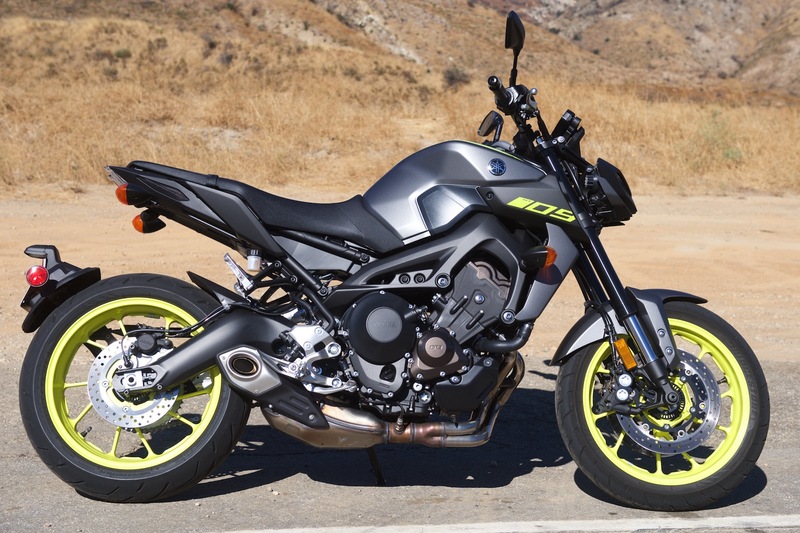 For 2018, the Yamaha FZ-09 becomes the MT-09, following the same worldwide protocol as the other FZ models. 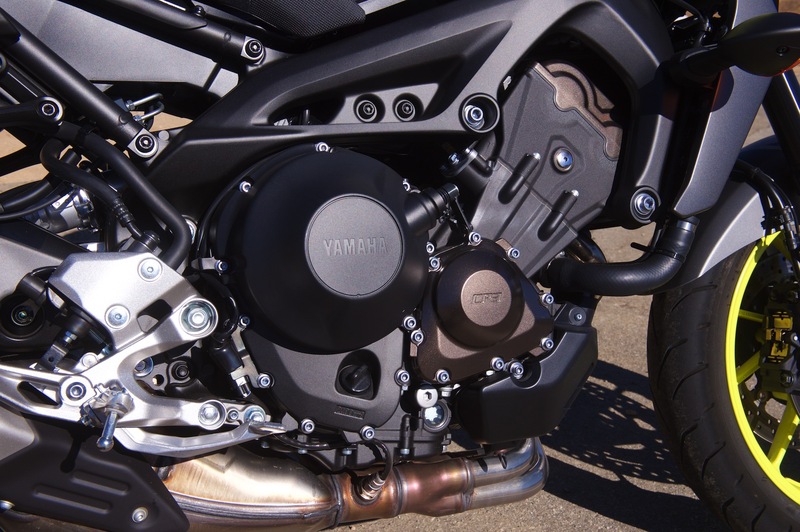 MT stands for Master of Torque, but there is much more to the 2018 Yamaha MT-09 than a torquey inline-3 motor. 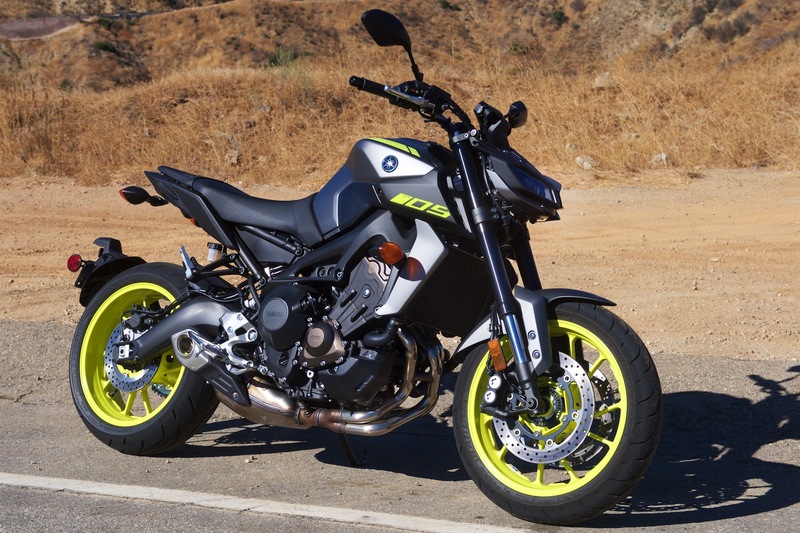 Although the new MT-09 is no different from the exiting FZ-09, it still gives us an opportunity to rediscover this underappreciated naked sport motorcycle. 1. If you’re a typical street bike rider and do most of your riding in the real world, the 2018 Yamaha MT-09 lacks for nothing. 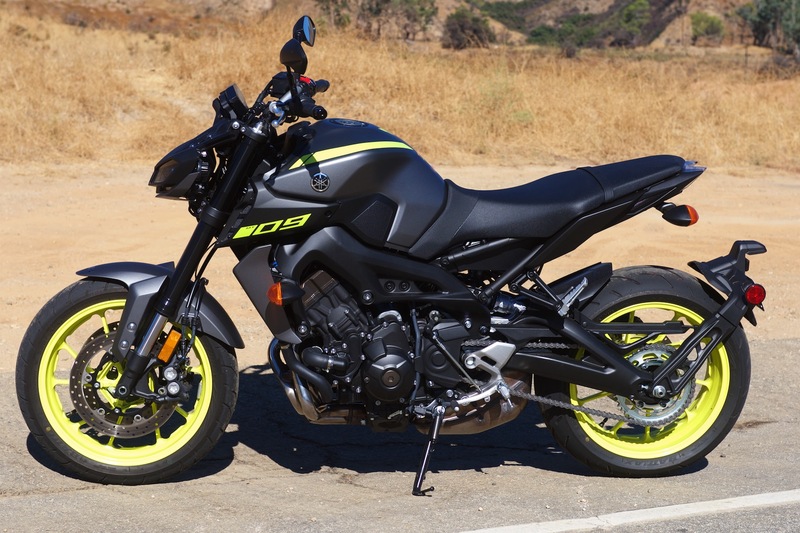 This model is perhaps sometimes overlooked on the showroom floor as its brilliant MT-10 liter-class sibling overshadows it. However, the MT-09 may surprise even the hardest core rider, as it has more than enough easily usable horsepower. 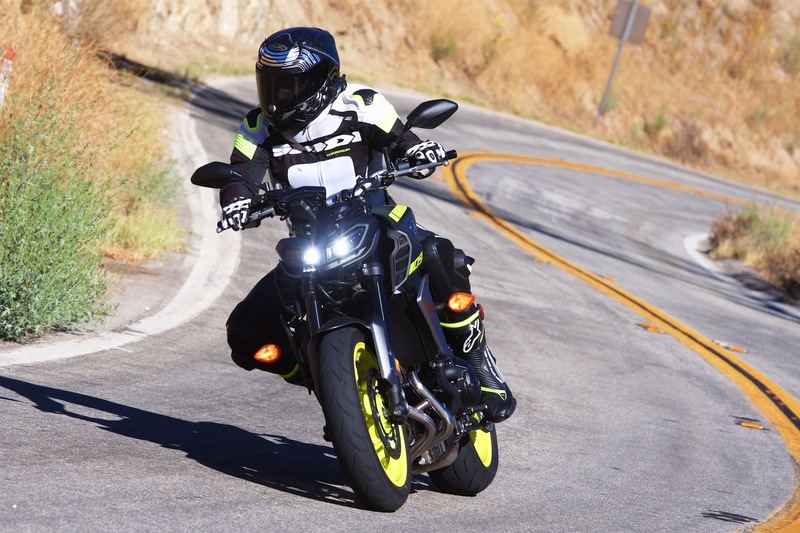 Coupled with excellent handling, the MT-09 is enough to entertain even the most aggressive rider, and at a price $4000 lower than the inline-4 MT-10. 2. The MT-09 shines in local canyons and urban riding situations. The flexible, torquey motor is allied to a tall stance. In traffic, the instantly available squirt and excellent visibility make for safer riding. Plus, the upright almost-supermoto riding position is extremely comfortable. 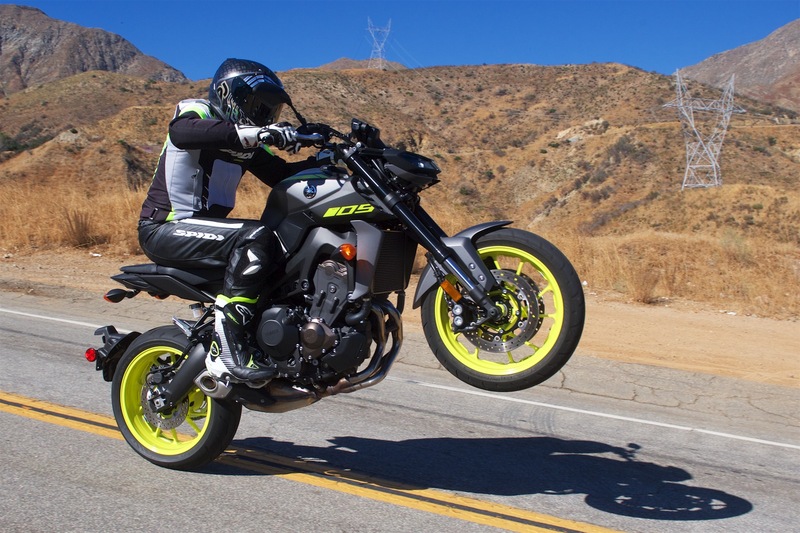 The downside of the MT-09’s height is that shorter inseam riders will have a challenge flat-footing when stopped due to the 32.7-inch seat height. 3. The MT-09 has three riding modes. The default STD (standard) mode is complemented by A mode, for increased throttle aggression. B-mode has reduced power and aggression, which is useful in low-traction conditions such as wet weather. 4. The impressive 900cc three-cylinder Crossplane Crankshaft Concept CP3 motor produces tons of low-down torque and is a dream to ride on the street. The motor spins up quickly, and seamless power is delivered all the way to the limiter. It happens so efficiently that in the lower gears that it is easy to hit the rev-limiter on a regular basis. I found it took some getting used the feel of the engine to know when to change up a ratio instinctively. 5. There are no flat-spots in the power delivery, and low-down torque feels exceptionally good. However, the MT-09 also suffers from the MT-10 and R1’s somewhat jerky throttle response in the A mode, especially in the lower gears. 6. In normal riding, where smooth initial power is critical in second and third gears, I found the STD mode to be much preferable over the aggressive A mode. Both modes produce full power, but STD is a lot less aggressive initially and turns the MT-09’s throttle connection into a pleasant experience. 7. 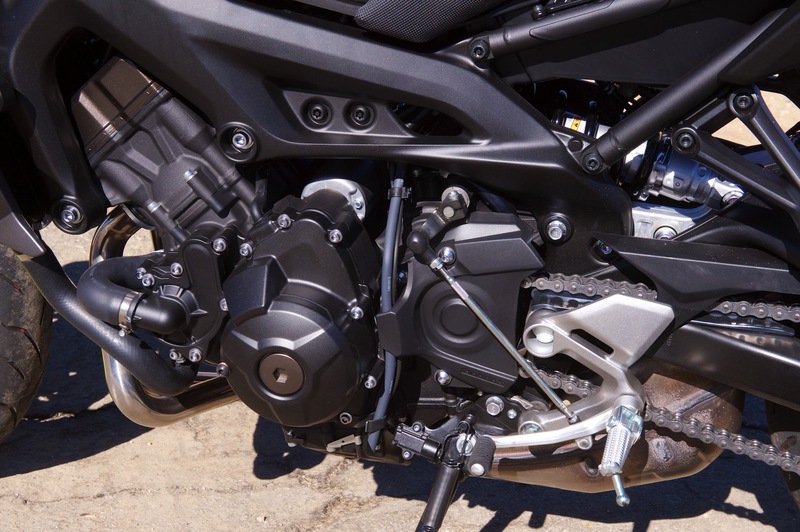 If you’re a wheelie fan, the 2018 Yamaha MT-09 is an extremely enthusiastic participant in both STD and A power-modes, in the first two gears. Again, I found the more user-friendly STD mode helped modulate the height of the front wheel and the speed that it comes up. 8. The MT-09’s gearbox is generally very smooth and works well. I have the occasional challenge finding neutral when at a standstill, but in general, ratio-swapping is smooth and precise. There is no clutchless-upshift or blip-downshift function on the bike. I’m spoiled enough that I did miss it. It’s a reminder that the motorcycle costs less than $9k, the same as the previous year. 9. The MT-09’s electronics suite is simple, yet effective. ABS is standard and cannot be defeated (another good thing) or adjusted. In contrast, the MT-09’s traction control has two settings, plus off. Level 1 has the least intrusion and no matter how hard I rode the bike I couldn’t reasonably find a way to test the traction control. It allowed unfettered wheelies, as well. Level 2 is quite a bit more intrusive and does come in at even quite a modest pace. Wheely restriction is fairly strong. 10. Brakes on the MT-09 are excellent. There is plenty of feel, and enough power to stand the motorcycle on its nose in an emergency. On occasion, I could feel the ABS pulsing a little when hard on the brakes over sketchy urban road surfaces, so it undoubtedly helps. 11. 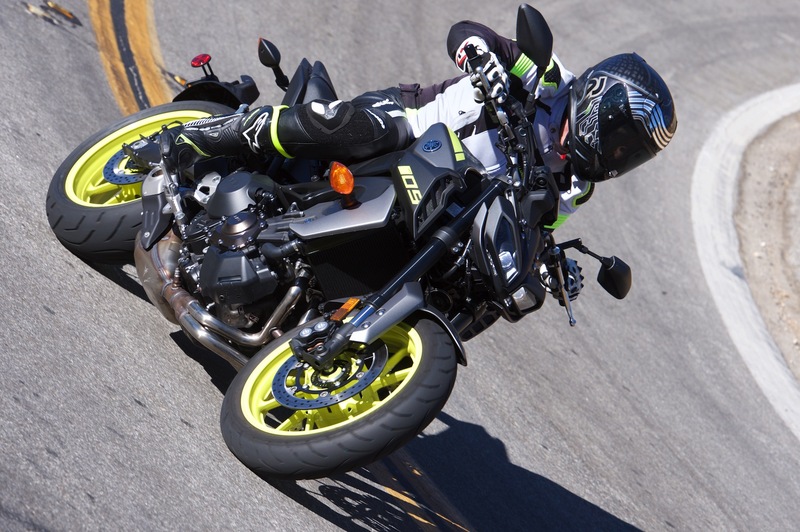 The MT-09’s KYB suspension is a significant upgrade over the first FZ-09. The sportier feel from the stiffer fork is fun to explore at speed, although the soft linkage-free KYB shock did need cranking up a bit to match the capability of the adjustable fork. Once I was satisfied with the settings, I was very impressed by how easily the MT-09 turns in, its mid-corner stability, and how user-friendly the handling is on this motorcycle. 12. The handling proved itself in one slippery corner. There must have been fluid or something similar in a slow-ish corner, as I lost the front fairly alarmingly. Although it wasn’t quite a Marc Márquez level of front-end save, it was definitely a buttock-clenching moment for both my passenger and me. Kudos to the MT-09 for staying stable until the Bridgestone Battlax Hypersport S20F front tire found its grip once again. There’s nothing quite like a close moment to make you appreciate a motorcycle’s strengths; the MT-09’s balance and sweet handling helped save the day. 13. The MT-09 is quite comfortable for a passenger. The back seat looks a little thinly padded, and it narrows towards the rear. However, I was informed that the perch is comfortable and the ride reassuring to a passenger. There are no grab rails to speak of, but with the willingness of the MT-09’s motor and its propensity to wheelie when the hooligan spirit makes itself known, it’s probably better if the pillion holds on to you for better security anyway. 14. 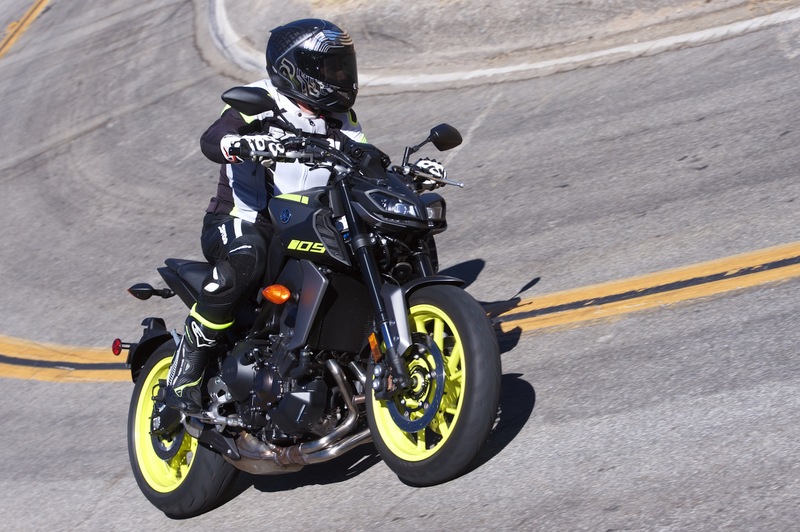 The 2018 Yamaha MT-09 is a lovely machine that does everything it was designed to do extremely well. If you insist on riding in A-mode around town or slow corners you will complain about a snatchy throttle. But, if you use the power modes as they are intended, you will be thrilled with this motorcycle. 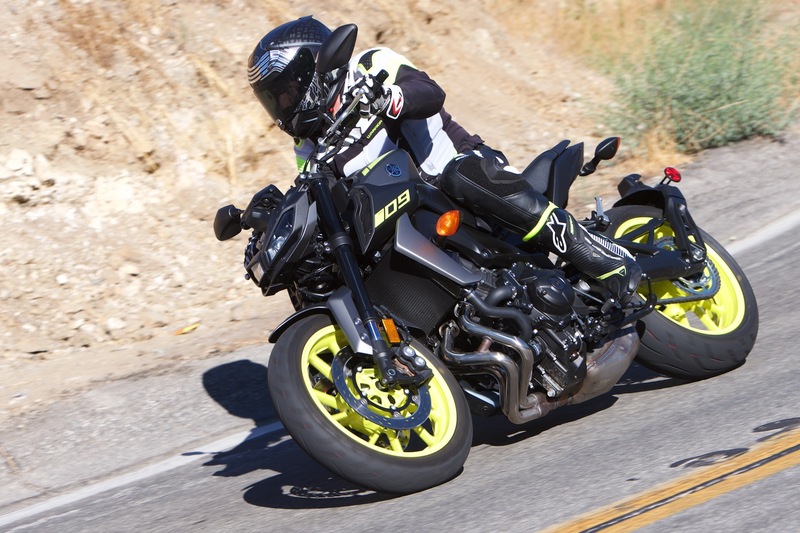 The 2018 Yamaha MT-09 is a fantastic value, and delivers as promised.